Trading Platform that offers DOM trading, real-time quotes, real time P/L and single-click trading. PATSystems J-Trader is a sophisticated trading system that combines extensive direct access to Futures, Options, and Equity Exchanges, real-time streaming price distribution and advanced pre-trade risk management functionality. 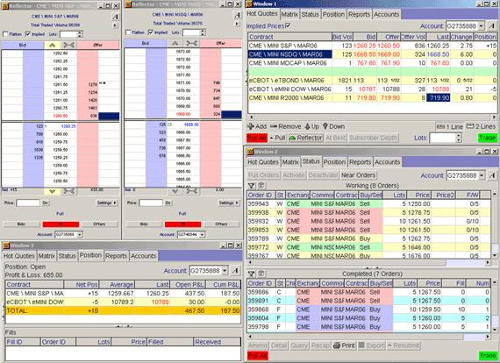 The J-Trader package includes, amongst other features, depth of market, status of all orders, real-time profit & loss and functionality for single-click trading. Hot Quotes - An order entry and price discovery system for trading multiple exchanges and contracts. Depth of market screens allow the user to display any contract's full order book in real time. Internet Connection: DSL/Cable or better for live accounts. Wireless connections are NOT recommended. Additional Software: The latest version of Java is required to operate J-Trader.